This work consists of a single sheet, 44 X 81.6 inches. The images were photographed on a bicycle trip I took, alone, from Toledo, Ohio, to my home in Chicago, Illinois, over three days in August 2004. The top line of images shows downtown Toledo, and the bottom, my arrival at the rear entry to my apartment building in Chicago. 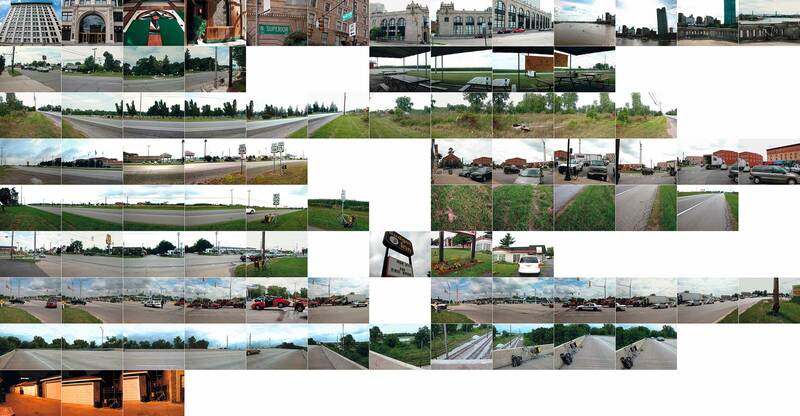 Each intervening line shows images taken on rest stops, or when I was starting in the morning. Where there are two sets of images on a line with two spaces between them, I have combined two different locales in the same line. The locales are shown in their order in the trip, left to right and top to bottom.